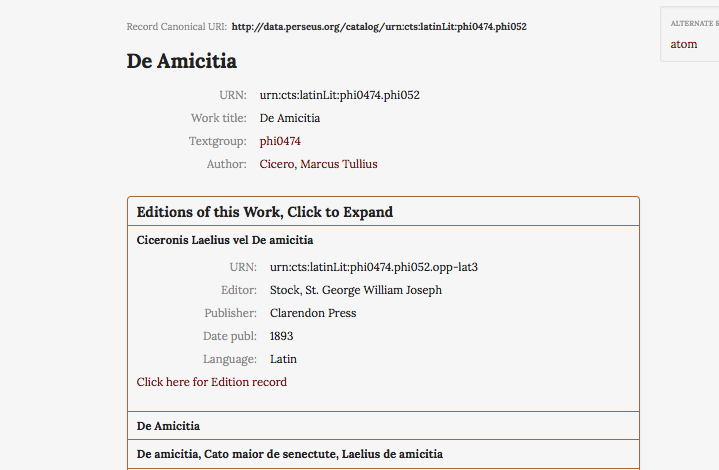 Every work that has been cataloged has a top level work record with a canonical URI, such as the De Amicitia of Cicero, a part of which is illustrated below. 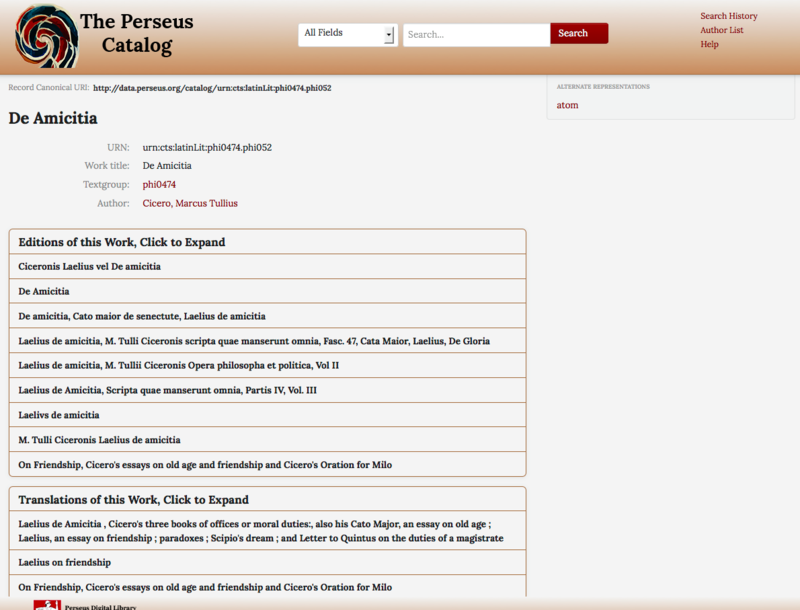 This record includes the CTS-URN identifier, the work title, the textgroup and author name, as well as an expandable list of “Editions of this Work” and translations of the work found in the catalog. Expanding any edition or translation on the work record will give the user the URN, the editor, the publisher, the date published, and the language. By selecting “Click Here for Edition Record” the user will go to a full record for that edition, as described in the next section. 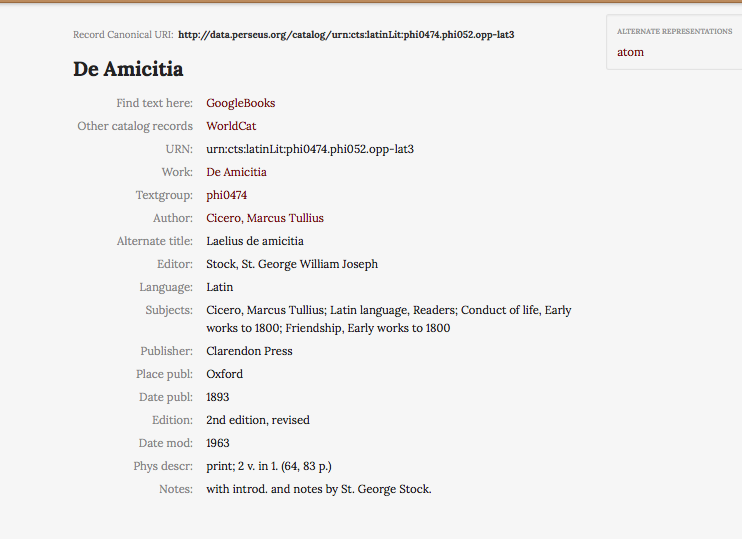 Having followed the link in the section above (Click here for Edition Record), sample results for an edition record appear. Find text here: A list of online versions of the work, links can be to GoogleBooks, HathiTrust or the Open Content Alliance. These links can be to entire books such as with the work here or to page level links to individually cataloged works found within the book. Other catalog records: Links to Worldcat.org, Library of Congress record, and Open Library for this edition. URN: Full CTS-URN identifier for this edition. Work: A clickable work title that returns to user to the work level record. Textgroup: The textgroup for this work. Author: A clickable link to the author’s authority record/canonical author page (illustrated below). Alternate Title: Any other titles listed in the bibliographic record. Editor: The editor of this version of the work. Language: The language of the cataloged work. Subjects: Typically only found in records for books that contain single works. Publisher: The publisher of this edition. Place of Publication: The location where this edition was published. Date published: The date this edition was originally published. Date Modified: The date a reprint was issued. Physical Description: A description of the physical version of the digitized edition (typically page numbers) or volume listings. Notes: Include various types of information. The majority but not all of the authors found in the catalog have author level pages/authority records, and the information found in these records can vary, issues that are described further in Data Limitations. Textgroups: List of relevant textgroups for the author. 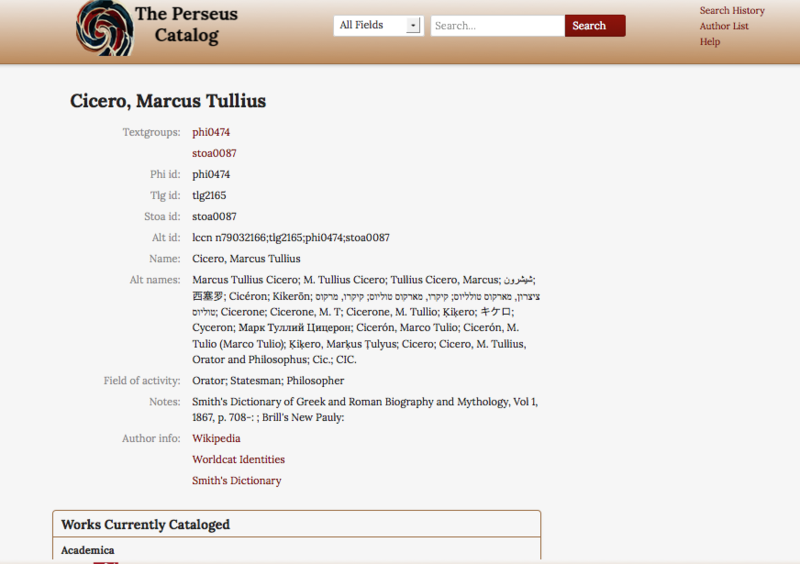 Phi id: Identifier for Latin works from the PHI Canon. 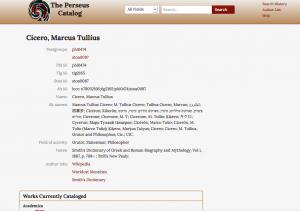 Tlg id: Identifiers for Greek works from the TLG Canon. 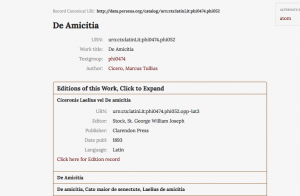 Stoa id: Identifier for Latin works from the Stoa registry. Alt id: Usually a LCNAF number. Name: Authorized name in the authority record under which all records are cataloged. Alternative Names: List of alternative names for the author, often in different languages. Fields of Activity: Various activities are listed here including orator, philosopher, epigrammatists, etc. Notes: Various information, typically sources used to pick alternative and variant names. 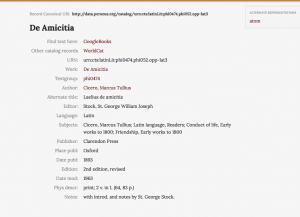 Author info: Links to online reference pages for the author including Wikipedia, Worldcat Identities, VIAF, and Smith’s Dictionary. Works Currently Cataloged: An alphabetical list of the author’s works with links to their work records.